I've had a post in draft for a couple of weeks now about some personal/professional goals or my New Year's resolutions for 2009. I read Chris Brogan's "Your 3 Goals for 2009" and I loved his process. Think of how you want to be successful in 2009. Then, try to think in even broader terms. Extrapolate on the broader terms, and find one word to hang the idea on. So, I've decided to use it. Streamline: The literal definition is to design in a form that offers the least resistance to fluid flow. Stated another way, organize and simplify. There are many things in my life and work that I need to streamline, and an important skill to facilitate this is learn how to say no. I have a confession. I have years of blog content and resource collections. It is hard for me to find posts because I have too many categories and an idiosyncratic way of organizing them. It feels good to get that off my chest because if only to commit myself to making some changes. I need get rid of clutter, but I first need to do the redesign thinking process before getting into the details of the information design, look, and feel. I've gotten a lot of great advice about how to get started and I will share it as I plan to blog what I learn about taking this blog to the next level. There are some technical or graphic design needs that I can't do myself, so I'm getting help from some of my colleagues, including Laura Whitehead, Tony Karrer, and Michelle Murrain. A few blog redesign resources I need to sink my teeth into after I share my goals, audience, etc. I also need to streamline the many wiki portfolios and resource collections that I've put together over the years. One way I'm going to do this is to focus on reorganizing them into these thematic areas. I also plan to continue blogging about these topics - focusing on writing in-depth thought pieces as well as aggregate and summarize the best thinking in the nptech field. I will also continue to write case studies, step-by-steps instructional pieces, and trend pieces. I want to improve my writing. I will also try, for the first time in my life, to have a blogging schedule for topics and to give more attention to proofing or at least reading my posts out loud before publishing. I hope to learn the art of sentence combining. Listening: I have focused on the free tools and have some great step-by-steps. This year I'll be adding Radian 6 to my toolkit and sharing what I learn. Social Media Audience Research and Social Network Analysis: I've been tracking social media research snippets for a while, but not in a very well organized way. I'll be gathering them up from my various digital nooks and crannies and organizing them into this space. Return on Investment, Return on Reflection: I will integrate my work on social media ROI with general nonprofit technology ROI More about this theme is below because it will be a major focus area for me this year. Mapping Metrics to Social Media Strategy: This wiki will be retooled to go deeper in more specific metrics linked to strategy. Smart Social Media Tips, Tactics, and Tools Most of the resource organizing will be taking place over at the WeAreMedia wiki in preparation for the workshops taking place in 2009. Information Coping Skills and Social Media Productivity Skills This is more personal use, but if you are a nonprofit professional tasked with social media strategy you will need skills in these areas. It is an area that I need to learn more myself. Free Agent Social Fundraising:I am very interested in seeing how people can take action on their own, outside of an organizational context, because of the connectedness that social media has facilitated. This will be a new area of inquiry and a major one for me. Effective Professional Networking Skills I've written about this in the next section. And, I also need to make my information tracking a bit more systematic. I have a very non-linear, creative approach to this - which is good because it can lead to creative thinking. On the other hand, it can lead to a lot of futzing, getting overwhelmed, and distracted. Over the past couple of years, one way that I synthesize blog content has been to do presentations. I want to create presentation formats of this materials as well as experiment with e-books. This will go hand in hand with the training work I do. I get many, many requests or rather pitches to write about a specific project or product. I can't write about them all and unless they fit in with my areas of inquiry, I might be more inclined not to write about. Just something to keep in mind if you're pitching me. 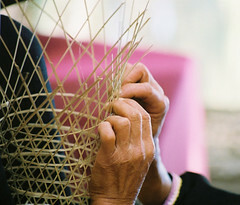 Weaving: This goal is more conceptual and may not make sense to anyone but me. It is about being a better network weaver and the ability to scale. I'm just one person. I have this fantastic but large network. I want to do a better job of connecting people in my network to one another, the art of network weaving and building social capital. But there's more to the weaving word than, well, network weaving. I like to think out of the box and I hate silos. That's why I maintain a large and varied RSS reading list of folks from within and outside of the nonprofit area. I want to do some better weaving between the various networks and topics. One thing that I have grown away from in my blogging is the 101 or entry-level social media. I know this because I've had complaints from people that they don't know what I'm talking about. One example recently was I post I wrote about a Twitter tool. Someone emailed me to complain that I didn't link to a definition of Twitter. I've been guilty of lapsing into "inside baseball" posts where you have to know about a particular social media tool to understand what I might be saying. Einstein: The quote has stimulated a lot of creative thinking. It inspired a new presentation for a December webinar called "How To Think Like A Social Media Marketing Genius" But the quote itself has made me want to explore how you use metrics for continuous improvement as well as impact. Return on Investment: This is looking at frameworks that let nonprofits evaluate the effectiveness of their social media strategies given the investment. I will be looking at this from lens of mapping strategy to metrics for those just beginning their social media strategies and those who are more advanced. I will look at benchmarking processes and analyzing benefits and values. I will explore in more depth the analytics tools. Return on Influence: This will be a deep dive into social media metrics and keeping an eye on the new tools that will no doubt debut to help us measure. Return on Reflection: This inquiry won't be all number crunching because you really miss the value of a ROI analysis. I will look at how qualitative information fits into the mix as well as exploring the value of intangibles. Even though we will no doubt have pressures to look at the numbers only due to the economy, I believe strongly there is value to intangibles. The most important value is how you can use reflection to improve what you're doing. Social Media Metrics Wiki is my personal learning space to track and ponder social media metrics, which grew out my research for an analytics screencast. Considering the ROI of Social Media: A Primer: As the facilitator of the NTEN's WeAreMedia wiki, we put together a primer and basic set of links about social media and ROI. Using ROI Thinking To Build A Community for Your Blog; My emetrics presentation that was well-received (4.8 score out of 5.0). It's based on a blogging benchmarking process that I've been using for several years. Managing Technology To Meet Your Mission Book from NTEN will be published in 2009. I wrote the chapter on ROI. Mapping Social Media To Metrics and Measuring The Return of Technology are two sessions that I'm designing for NTEN NTC 2009. 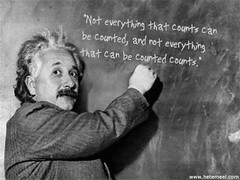 There is another concept here that relates to Einstein but not the ROI or Metrics piece. It's more of a personal goal - and it's about thinking creatively and having that reflected in everything that I do. This is the year I get back into tiptop physical shape - with a heart rate lower than my age. I've also got to get rid of those extra pounds. I'm off to make a desktop image of these visuals of goals so they are in front of my eyes for the year. "You" - With every person - family, client, friend or stranger, give them my undivided attention - as if they're the only person on the planet. "Birth" - Approach every challenge, every moment with complete freshness and vigor - a birth completely unfettered by the past. "Pillar" - Do my very best every day to create value and happiness for others, realizing that I am just one pillar among trillions of microscopic pillars in the universe. Hi there. I'm one of those much more elementary bloggers on social media for nonprofits and foundations--I'm aiming at more of a basic level...in part because I'm no where as knowledgable about these topics. But I'm utterly fascinated and have become an online sponge. I'm a mid-aged, senior communications practitioner from a philanthropy/nonprofit background and this is a whole new world for me, but I get more passionate about introducing nonprofits to it every day. I've liberally linked to your site in my content, and am very grateful you exist! Your blog, and many others, embody the spirit of generosity and sharing that's so important today. I look at the perfect economic storm local nonprofits are caught in and want to give them all the help I can on my own blog. That's why I created it. 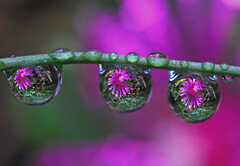 Your research and reflections are a great source of inspiration. Lookin forward to all your posts in 2009! One is tempted to say, "Now streamline your Goals for 2009!" Happy New Year and I look forward to reading you throughout the new year!